Looking to Sleep Off St. Patrick's Day? 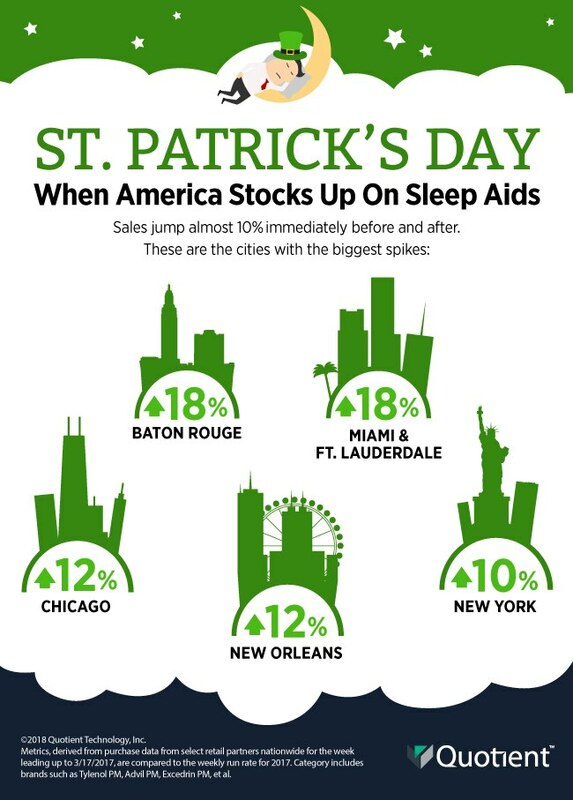 You’re in Good Company - Quotient Technology Inc.
MOUNTAIN VIEW, Calif.–(BUSINESS WIRE)– As the country gets ready to celebrate St. Patrick’s Day this coming Saturday, shopper data from Quotient Technology Inc. (NYSE: QUOT) reveals celebrants, and non-celebrants, are already looking to sleep off the experience as sales of over-the-counter sleep aids almost spike 10% during the week leading up to and after the holiday1. Other times of the year when sales of sleep aids spike include the week following New Years, the first week of September (Back to School), and the week after Thanksgiving. 1 Metrics, derived from purchase data from retail partners nationwide for the week leading up to 3/17/2017, are compared to the weekly run rate for 2017. Category includes brands such as Tylenol PM, Advil PM, Excedrin PM, et al.